Are you ready to add some adventure into your life this summer? Great, because we have the lowdown on some of the newest, hottest, and most exhilarating attractions across America! First up on our list, RIVERSPORT OKC! This Oklahoma City attraction is fun for the whole family, featuring everything from rock climbing for children to class IV whitewater rafting! This multi-million dollar outdoor recreation venue is located downtown within the Boathouse District, with two additional locations at Lake Overholser and Lake Hefner. One major bonus of visiting RIVERSPORT, aside from the fun you will have? All pass sales benefit community youth outreach programs and provide coaching, equipment, and athletic facilities for Olympic hopefuls training in OKC. How cool is that? The overall mission here at RIVERSPORT OKC is to focus on 'fun, fitness and encouraging people to take on new challenges'. **Note this attraction is open daily during the summer and on weekends in spring and fall. Whitewater Rafting and Kayaking - Enjoy rapids from Class II to Class IV. Sandridge Sky Trail - The tallest of its kind standing at 80 feet! 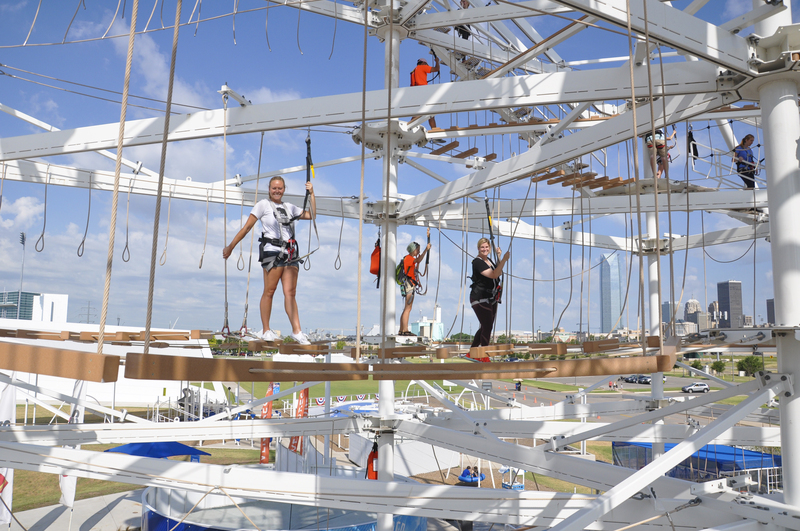 Sandridge Sky Zip - End your Sky Trail journey by zipping 700 feet across the Oklahoma River. SUP Boarding - Get a full body workout and have tons of fun while doing it! Pump Tracks - RIVERSPORT holds 3 world-class Mountain Bike/BMX courses. Slide the Rapids - Enjoy a 600-foot journey down the slide on Love's Island. Extreme Jumping - Safely enjoy jumping up to 20 feet into the air. Youth Zone and Pavilion - The kiddos can enjoy Sky Tykes, Cloud Bounce, and Kid Zip here. Dragon Boating - A growingly popular water rec sport you won't want to miss out on. High-Speed Slides - The tallest slide complex in the country, allowing you to hit speeds of up to 22mph. Teambuilding - Sign up for a company, school group, or family reunion group teambuilding sessions along the Sky Trail and more. Grab a bite to eat at Big Water Grill or do some shopping at Outfitters before you go!